SONGDA continues to move ENE and has weakened into a category 1 typhoon. At 8 am, SONGDA was centred about 2330 km (1260 NM) ENE of Tokyo. SONGDA is the 112th name in the tropical cyclone name list. It was contributed by Vietnam, and is the name of a river in the northern part of the country. This name was used in 2004 and 2011. SONGDA will continue to move ENE along the westerlies and the northern periphery of the subtropical ridge in the next 12 hours. SONGDA is undergoing extratropical transition as its convections are sheared towards the northeast from the circulation centre in a region of very high vertical wind shear. The storm should turn fully extratropical by t+12. This is the final bulletin on SONGDA. 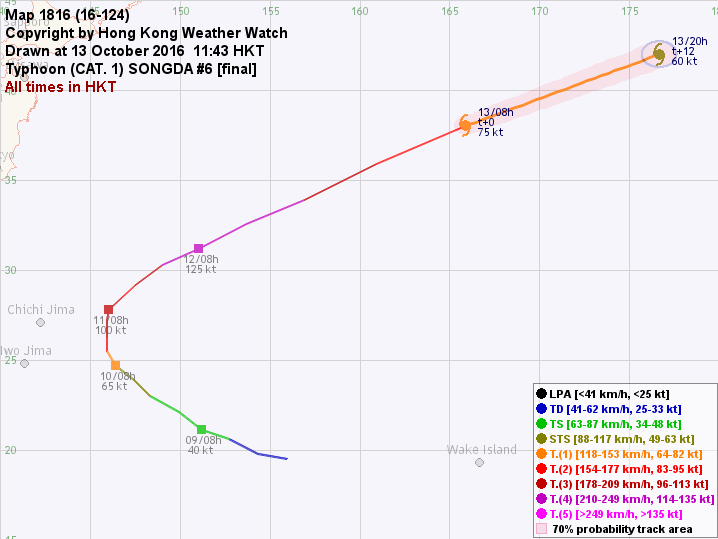 SONGDA re-intensified last night and reached super typhoon intensity. 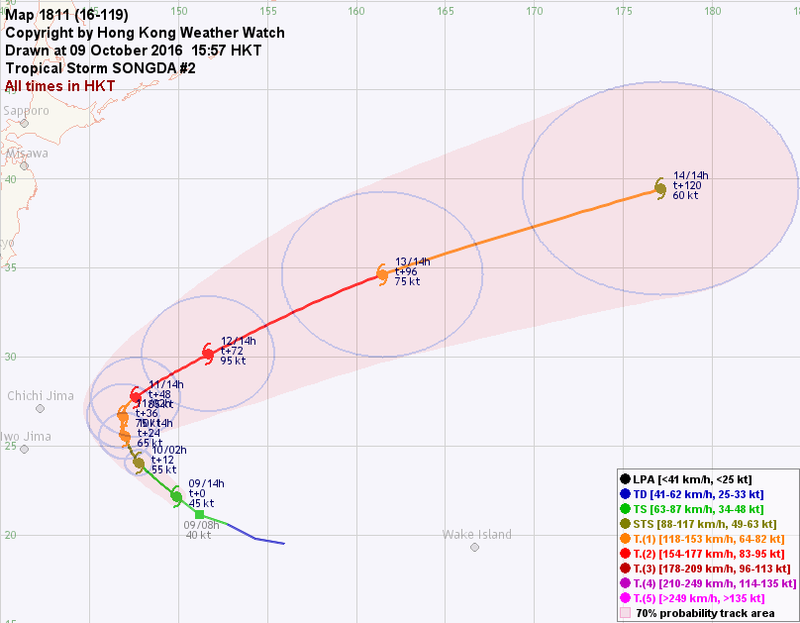 It has weakened into a category 4 typhoon as it accelerates towards the ENE. At 2 pm, SONGDA was centred about 1330 km (720 NM) E of Tokyo. SONGDA is moving ENE along the northwestern periphery of the subtropical ridge. The storm is entering the westerlies and will continue to accelerate in the next 24 hours. SONGDA's eye enlarged and deepened last night; its central dense overcast is still very compact although it has crossed the ridge axis and is moving quickly. Weakening is expected as vertical wind shear rises and sea temperatures decrease. It will turn extratropical near t+24, still as a powerful system. 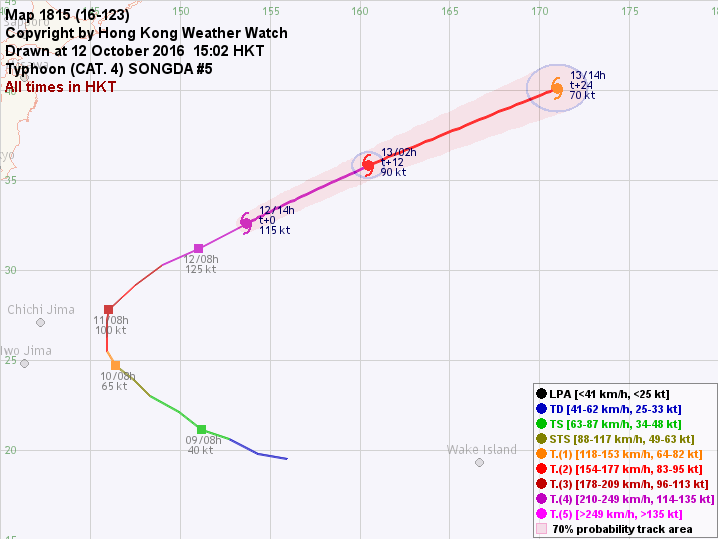 SONGDA intensified into a category 3 typhoon last night but is now weakening gradually. At 2 pm, SONGDA was centred about 680 km (370 NM) NE of Iwo Jima. SONGDA has crossed the subtropical ridge axis and is now moving northeast along its northwestern periphery. The storm will move NE turning to ENE in the next 48 hours, and will accelerate within the westerlies. SONGDA's eye is becoming cloud-filled. The storm is entering a region of much higher vertical wind shear. Together with a decrease in sea temperatures, the storm is expected to weaken steadily during the forecast period. Extratropical transition should commence near t+24 and be complete before t+48. 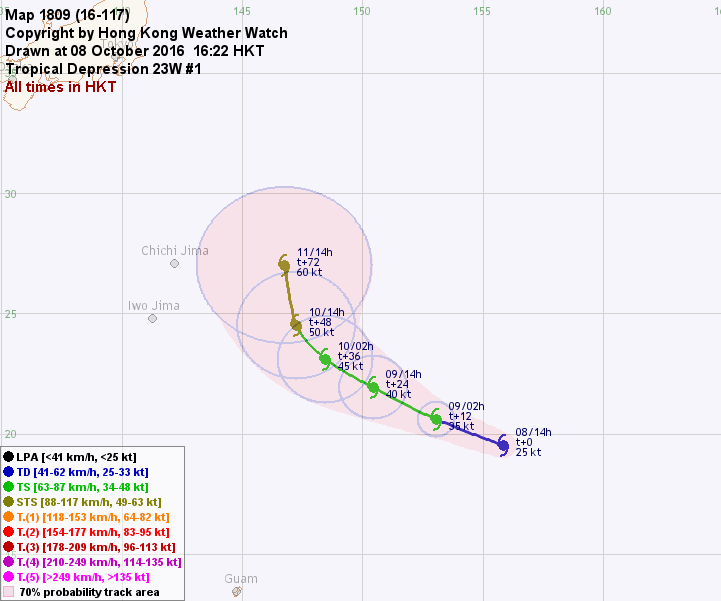 SONGDA has intensified quickly into a typhoon, and is turning north. At 2 pm, SONGDA was centred about 470 km (250 NM) E of Iwo Jima. SONGDA is now situated in the western periphery of the Pacific subtropical ridge, and will cross the ridge axis in the next 12 hours. It will then turn northeast along the northwestern periphery of the subtropical ridge, and should accelerate within the westerlies. SONGDA has developed a solid central dense overcast and an eye is clearly embedded in the centre. Due to improved outflow associated with the passing trough and warm sea temperatures, the storm is expected to intensify in the next 12 to 24 hours. It will weaken after that due to increasing vertical wind shear, and extratropical transition should begin near t+48. SONGDA is expected to turn extratropical before t+72. 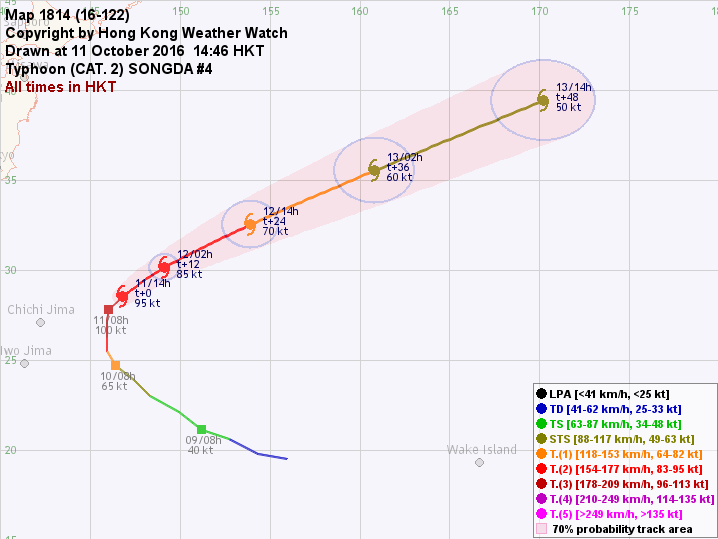 23W has intensified into a tropical storm, and was named SONGDA. At 2 pm, SONGDA was centred about 920 km (500 NM) ESE of Iwo Jima. The centre of the Pacific subtropical ridge has shifted east. SONGDA is now in its southwestern periphery and will move increasingly poleward. It will decelerate and cross the ridge axis near t+36, and will then recurve sharply towards the ENE. As the storm becomes embedded within the westerlies, it will move rather quickly towards the end of the forecast period. SONGDA's structure is symmetric although there are more convections in the western semicircle. Intensification is expected as outflow improves ahead of a passing trough, and sea temperatures remain favourable. It should reach maximum intensity between t+48 and t+72, after which gradual weakening and extratropical transition will occur. Tropical disturbance 94C in the northwest Pacific has intensified into tropical depression 23W. At 2 pm, 23W was centred about 1610 km (870 NM) ESE of Iwo Jima. The Pacific subtropical ridge is anchored southeast of Japan. 23W is in the southern periphery of the ridge and is expected to move WNW quickly in the next 24 hours. The storm will reach the southwestern edge of the ridge near t+24, and will move increasingly poleward after that. Its track speed will also decrease as it crosses the ridge axis near t+72. After several days of organization, 23W is finally showing a decent banding signature, with more convections in its northwestern quadrant. Gradual intensification is expected in the next 72 hours as sea temperatures are rather high and vertical wind shear is at a low to moderate level. As outflow improves, a faster rate of intensification is expected near t+72.